If you love basketball, then there aren’t many better sounds than having the best indoor basketball bounce on well polished hardwood. And as you probably know, there is a huge difference between a basketball being played outdoors or indoors. As expected, indoor surfaces are a lot let abrasive and a lot softer than outdoor surfaces. It is because of this that indoor basketball are made with softer materials, feel a lot more natural in the hand, and provide better grip overall. However, with these softer materials, durability becomes a major issue. That’s why high quality indoor basketballs are typically a lot more expensive. A cheaper alternative is to find a good indoor/outdoor basketball – but they usually lack the same quality as those on this list. In this guide, we go on the hunt to find the best indoor basketball on the market to ensure that you know exactly what you’re buying. In particular, we look to the DURABILITY, PERFORMANCE and PRICE in our reviews. This gives us the best possible foundation to find the products worth every penny. You won’t find any outdoor basketballs on this list, as they are typically not the most suited to indoor play. In our opinion, the Wilson Evolution Basketball provides everything you need in an indoor basketball. This is a premium indoor basketball at a great price – being the number #1 most sold indoor basketball in US high schools – and approved by both NCAA and the NFHS. It is also Amazon’s Choice as well! Wilson creates the Evolution basketball with their Cushion Core Technology – providing a really soft spongey feel that allows for consistent bouncing on the hardwood floor. This is in addition with Wilson’s composite material and micro pebbled surface that provides a really grippy surface to best improve ball handling. For an indoor basketball, it has a very decent lifespan and won’t fall apart when first used. When treated well, the basketball can last for years on end – retaining it’s ability to hold air. For us, this is the best indoor basketball on the market, and a serious option for anyone to consider. Comes in Youth, Intermediate and Official Sizes. Amazon’s choice, Best Seller and always in stock – most people swear by it! Don’t like the big brands? Want something different? Then C2C The Rock might be the perfect basketball for you. 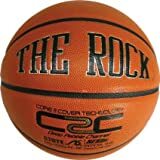 Contrary to it’s name, C2C’s The Rock is an indoor basketball – and should not be used outdoors. In terms of feel, The Rock is an extremely tacky ball with a soft, genuine leather feel to it due to C2C’s patented sponge rubber carcass. Surprisingly, this soft rubber does not compromise the ball’s durability. This basketball is particularly good at maintaining shape, retaining air, and minimising overall wear and tear. Coming in at a higher price point, the C2C does not need any breaking in period. Concerned? Don’t worry. The ball is of official size and weight – has a certificate of authenticity. A serious option for any baller – and a fantastic alternative to the big named brands. It does, however, only come in the Official 29.5″ size. A name synonymous with basketball, the Spalding TF-1000 is an absolute classic indoor basketball that some players completely rely upon. In particular, the TF-1000 has been around in one form or another for decades. Once broken into, it has arguably one of the best feels of any indoor basketball on the market. This is due to Spalding’s ZK composite leather compound. Not only does this leather compound aid grip, but alongside the deep channel of the balls, the material is able to manage and disperse moisture that builds up on the ball. This really does help overall handling. For anyone looking for a competitive, authentic feel to an indoor basketball – then there are not too many better than the TF-1000. Take care of it properly, and the quality of the ball should remain high for a few years. Only available in Intermediate ( 28.5 inch ) and Official Sizes ( 29.5 inches ). Again, just because it’s not Spalding or Wilson, doesn’t mean it’s a bad ball. 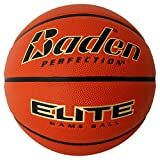 Baden makes some seriously high quality indoor basketballs, and in particular, the Baden Elite is NFHS approved – and the ball of choice for many high schools and colleges alike. The Baden Elite comes with the patented Cushion Control Technology, creating a soft feel and true bounce. It also deals with sweat very well, dispersing it as needed – keeping the ball dry during play. Baden also focus on minimising the rubber exposure of the valve system to ensure consistent grip across the entire ball. A small feature, but has a surprisingly big impact. In terms of durability, you won’t be disappointed with Baden. They seem to have mastered the wear and tear aspect of the basketball – it doesn’t scuff as fast as some alternative brands. Again, Baden’s ball come in Intermediate and Official sizes. For international options, Molten have been an absolute foundation in European basketball leagues. 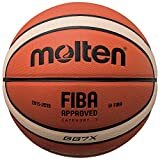 In particular, Molten is used in leagues such as the British Basketball League, and is FIBA approved – so it’s not like you’re not buying a subpar ball. Here, the Molten GG7X is an upgrade on the Molten GG7. And this is a seriously high quality indoor basketball. The difference between the GG7 and GG7X? A higher quality composite material for durability, as well as increased visibility. In particular, the composite material used by Molton feels like real leather, and takes next to no time to break into. This is in addition to the all-surface pebbling that is fantastic for grip and overall feel of the ball. Finally, the Dual Cushion Technology is implemented in the GG7X by Molton. Because of this, the ball feels like a high quality ball, whilst still being soft and spongey during play. In terms of aesthetics, the GG7X dons the Molten signature 12-panel design. Does this design play an impact? It’s hard to give a general answer, however, some players do find that the extra grooves on the basketball requires some time to get used to. Comes in Intermediate and Official sizes. However, the Molten sizing is about a half inch smaller (29″ basketball as opposed to the regulation 29.5″ for Official Size). Wilson have done it again with their Solution NCAA Indoor Basketball. This particular basketball is used as the official ball of the NCAA Championships (including March Madness) – being of official size and weight. In terms of grip, the Wilson Solution has a moisture absorbing cover which deals with sweat amazingly, with the ball typically feeling dry most of the time during play. This is alongside the thousands of micro-pebbles that are on the ball – you can’t really go wrong in terms of grip. It feels grippier than the Evolution, and feels slightly tougher harder – the Evolution feels spongier. However, in comparison to the Evolution, it cannot be said that the Solution is a more durable ball. Available in Intermediate and Official sizes. If you’re still unsure, we think that the Wilson Solution definitely is a good indoor basketball, and is a serious contender for best indoor basketball. There’s no denying that. However, the differentiating factor between it, and the Evolution, comes down to how spongey you like your basketballs, and how much you’re willing to spend. Due to the large range of indoor basketballs that exist out in the market, it may seem daunting as to which to go to. Here, we provide a general guide which may be helpful in aiding your decision as to which basketball best suits your needs. Just remember though, all play styles require a different ball. If you’re playing outdoors, please do not waste your money on a high quality indoor basketball. Most brands come in all three of Youth, Intermediate, and Official sizes. Each size is usually differentiated by an inch, and can have a significant impact upon play due to the size of your hands. For children who are younger, with smaller hands, it’s extremely difficult to master your fundamental handling and shooting skills by practicing with a basketball that feels abnormally large. We tend to always refer back to this image, but we think it provides perfect guidance for any baller looking to buy a ball. Take note though – the Molten sizes are usually half an inch smaller. This should be taken into consideration when buying an indoor basketball. When looking for a high quality indoor basketball, there aren’t a whole lot of materials that will provide awesome durability, alongside grip and feel. For hardwood and indoor surfaces, you can pretty much ignore rubber material. 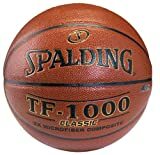 Whilst it is possible to buy a genuine leather basketball, they’re almost impossible to come across – and because only Spalding mass produce them, the quality of the ball usually dwindles. In our opinion, your best bet is a composite leather material. This will give you the feel and performance of a genuine leather ball, without the huge price tag. Also has a much softer feel and won’t require a long break in period. Such a large range of brands. Such a large range of basketballs…. And yes, such a large range of prices. This can, and most likely will, work in your favour. Set yourself a budget before you find a basketball. However. Be reasonable. An extremely cheap ball usually won’t offer the durability and performance as a basketball with a slightly higher cost. Our recommendation is a minimum of $45 as a starting budget for a good indoor basketball. Whilst there a a whole heap of different brands that make indoor basketballs, it shouldn’t be the only determining factor you consider. Yes, Wilson and Spalding are extremely well known in the basketballing industry as leaders. However, there are occasions where their options do not provide the best bang for your buck. Whilst we’ve broken down the best basketballs in this list, to be fully comprehensive, we seriously recommend thorough research when looking at indoor basketballs – there are more than just 2 or 3 brands out there! Your hands will sweat. It’s an inevitability. However, with indoor surfaces, the sweat doesn’t leave the ball. This is why moisture absorption, or moisture dispersion is important when looking at indoor basketballs. It’s a must have. 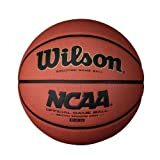 All the basketballs on this list are moisture absorbing, working similar like a sponge and ensures maximum handling control no matter what stage of the game it is. In order to ensure that your indoor basketball lasts, you need to take care of it. First – Never use it outdoors. It’s a basic tip, but it stands true. Indoor basketballs are made to be played indoors. Using it on rough, abrasive outdoor surfaces will absolutely destroy the ball in a short amount of time. Playing with your ball outside is a waste of money. You should also be wiping your basketball after every use. Treating your ball with respect and wiping down excess sweat and dirt from the ball will improve upon the durability of the cover. With full respect, some basketballs can last for years. Finally, it’s advised not to sit on, or kick the ball. This is a sure fire way for a basketball to lose it’s shape. A warped ball is no longer a useable ball. Everyone needs to spend some serious time finding the right equipment to suit. Here, we’ve broken down the most outstanding indoor basketballs that seem to dominate the market. For us, spending a bit of extra money will pay off. Don’t cheap out by purchasing the first cheap basketball you see at a dollar shop. 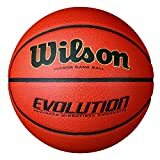 When looking for the right indoor basketball, taking into account all the factors that differentiate the different balls, we can’t go past the Wilson Evolution. It’s got everything you need, being offered at a great price, and has been awarded Amazon’s Choice. Of course, if you have any questions, queries or comments, please let us know via our contact us page, through our social media channels, or by commenting below.